Yesterday Ashley wrote about making Christmas Cookies on her blog. I started the tradition when I was a teenager and Ashley's brother Adam and his gang of friends became my enthusiastic partners when they were seven. 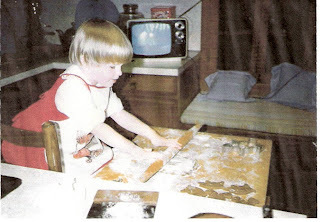 Ashley joined in the annual cookie making when she was two. This is a picture of her making Swedish gingerbread pigs in our house on Little Washington-Lyndell Road. While I started with the receipes in my Women's Encyclopedia of Cooking and my grandmother's fried rosettes, Ashley and I ventured into more challenging receipes, some of which I will never have the energy to repeat. One was an enormous batch of incredibly delicate Swedish cardomom flavored snowflake cookies decorated with blue piping, silver dragees and irridescent edible glitter that we spent a whole day decorating when she was a teenager. I also remember the two of us in the little kitchen at Windy Hill trying out our new pizelle maker which required tight coordination to get them out of the griddle before they burned. we need to make pizelles next Christmas!